As you might remember when I reviewed The Tick Vs. Season One, I stated that the Tick is a really funny cartoon series. And this stands for the second season, which is releasing on DVD shortly. Yes, the was a short lived live-action series as well, and yes it was funny too, but it just can't live up to the hilarity of the animated series. And it's really not hard to understand why when you look at the animated series. 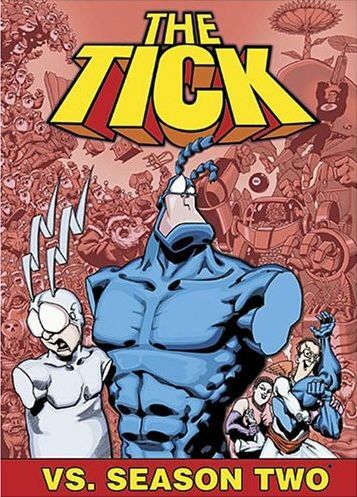 I mean, the third episode of season two (which is the second episode on the disc) had The Tick and Authur loosing their arms... literally! They are shot with some new weapon and their arms just drop off... and are snatched up by the bad guys so they can put the arms on robot versions of The Tick and Author. There's just no way you could do something like that in a half-hour live-action series. Well, at least not back in 2001. They could actually probably pull it off nowadays. Much of my review for The Tick Vs. Season One also stands for The Tick Vs. Season Two . It still contains the hilarious dialog and super-bizarre evil plots. Many off the off-the-wall bad guys (and good guys) return this time around, and some new ones show up as well. Who? Well how about an alien race that looks exactly like Authur in this moth costume that are trying to destroy the galaxy. Or how about a villain to builds a machine to extract inventors from history so that he can invent their inventions? Intrigued, yet? If so, might as well check out this The Tick video montage. The Tick Vs. Season Two , just like The Tick Vs. Season One, contains 12 out of the 13 episodes from season two. Unfortunately, poor old episode 15, Alone Together , has been left out for some reason. Don't ask me why they happen to leave out one episode per season, because I really don't know, and I have no clue as to if this trend will continue with the third season. But, just like the first box set, there is enough here that the set is still worth it. Leonardo da Vinci and His Fightin' Genius Time Commandos! The Tick Vs. Season Two is being released by Buena Vista Home Entertainment on DVD starting August 7, 2007. Check out the official website for more information.